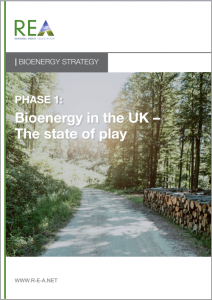 This is the first instalment of the REA’s industry-led Bioenergy Strategy for the United Kingdom, which aims to set out a clear vision for the role bioenergy has to play in the decarbonisation of the UK’s energy requirements across power, heat and transport up to 2030 and beyond. Phase one of this report reveals Bioenergy as a major contributor to cutting emissions and boosting green jobs in the UK today. Bio-based fuel technologies are estimated to cut 19.7 million tonnes of CO2e per year, replacing £21 billion worth of fossil fuels and supporting 46,000 jobs throughout the UK. The Committee on Climate Change projected last year that bioenergy could double as a proportion of the UK’s primary energy supply by 2050. However, promises made in 2012 by the Coalition government to renew its strategy by 2017 failed to materialise, leaving the sector to drift. The gaps in the policy and regulatory framework are now growing, with existing support mechanisms ending, and the pipeline for future bioenergy projects being constrained.